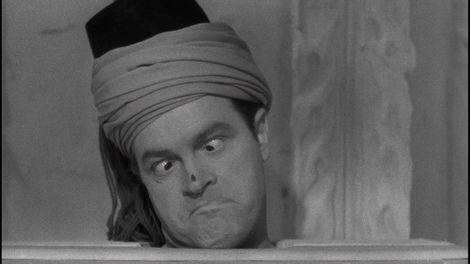 There is an undeniable charm to “Road to Morocco” that I’ve never seen in any movie before. Maybe it’s because of the volatile yet infectious relationship between its two lead characters, Bing Crosby and Bob Hope, where they simultaneously love and hate one another, leading some of wonderfully crafted insults. Maybe it’s because of how it expertly spoofs adventure tales of the 1930s and 1940s, while still creating its own identity with its self-referential humor. Or maybe it’s the opening musical number that perfectly describes the style and tone of the film. Whether you’ve seen this movie or not, or any of the “Road to…” movies with Crosby and Hope, you are probably at least familiar with its style of screwball and fourth-wall break humor that is always good for laugh. Many other famous TV shows and movies have done countless parodies of these movies, with the most famous examples being several episodes of “Family Guy.” And while many of those parodies are charming in their own right, none of them can really compare to the wisecracks and desperate nature of Hope and Crosby’s relationship and their performances. “Road to Morocco” follows our two “heroes” Jeff Peters (Crosby) and Orville Jackson (Hope) after their freighter in the Atlantic ocean explodes (they were the cause of the explosion) and the two are adrift at sea until they finally land in Morocco. They eventually reach a town, where Jeff sells Orville to some shady man in a bar, saying that they both need the money. After feeling (somewhat) guilty, Jeff eventually decides to track down his friend and learns that he’s living in the lap of luxury, having been betrothed and is to be married to exotic princess (Dorothy Lamour). Jeff, of course, cannot stand seeing Orville so happy and has to intervene. I never thought that two drastically different actors like Bing Crosby and Bob Hope could be the funniest duo since Abbott and Costello, but the two have a zany yet spiteful time together. Crosby is calm and collected and is as smooth as his singing, while Hope feels like a fusion of Charlie Chaplin’s facial expressions and Groucho Marx’s wit, giving his a man who moves and acts more like a cartoon than a human. Together, the two of them form a foundation that is built on dynamite and marshmallows. 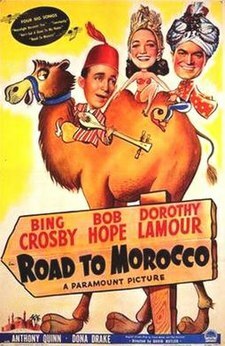 Everyone owes it to themselves to see at least one “Road to…” movie in their lifetime, if only to see the strange yet charming back-and-forth between Hope and Crosby, and “Road to Morocco” is a wonderful place to start.